Tradesmen such as builders, plumbers, carpenters, painters and electricians may benefit from insurance that can protect their equipment and stock, and pay out if something does go wrong to cover compensation. We've teamed up with Axa to offer people 20% off their business insurance. Join our our builder, carpenter, plumber, electrician, and painter and decorator insurance groups to unlock the deal. You can get tailored quotes from companies such as Axa, Direct Line and Hiscox. It's important to shop around for the best prices and cover levels. Both self-employed tradesman and those working for a company can benefit from tradesman insurance. If you work for a company, you may be covered for some things, but you may still need to get your own cover. It's best to check with your employer about this. Do I need tradesman insurance if I'm contracting or subcontracting? 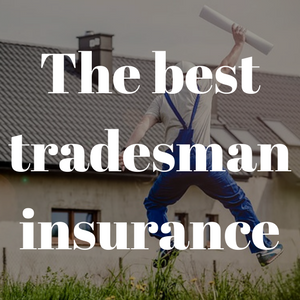 What else do I need to know about tradesman insurance? If you have a different business, take a look at our other groups for business insurance here. In some cases, you may not need employer's liability insurance - for instance, if you employ a family member or someone who works abroad. However, it's always best to check; if you aren't properly insured, you can be fined up to £2,500 a day until you are insured. You can also be fined up to £1,000 for not displaying your employer's liability certificate or refusing to make it available to inspectors if they ask for it. Aside from any legal obligations, tradesman insurance can be reassuring to any customers or employees you work with. If a customer knows they will be covered if anything does go wrong, they may trust you more and it shows your employees that you care about their welfare. Some clients and recruitment agencies will only take on workers who have insurance. On top of this, business interruption insurance can be useful for tradesmen. If something happens to your business - your equipment is stolen or damaged - and you are unable to work, business interruption insurance can pay a set amount to replace your regular income. When making the decision about whether you should get insurance, think about the type of work you do, what could go wrong and what the consequences would be. You'll also need to take into account the cost of the cover. Find out about the average price of public liability insurance here. If you're a builder, the core cover you may want to consider is public liability, employer's liability and tool or equipment insurance. Other business insurance products or add-ons that may be relevant to your work or company include buildings cover, personal accident, own or hired plant insurance, stock and vehicle cover. Bought By Many members can get 20% off business insurance through our builders' insurance group. The most common public liability claim from builders is for structural damage, according to Axa. If the damage is severe claims can be large, which would be costly without insurance. Axa says builders' public liability insurance starts at £90.50 and the average policy costs £158.36 a year. Carpenters' public liability insurance can cost less than cover for other trades. Axa says prices start at £78.50 a year and the average premium is £111.20. The most common claim for the trade is fitted furniture collapse, which can be a pain for the client but may not be as costly as damage caused by workmen in other fields. Tool cover can be more expensive than other professions because carpenters use specialist, precision tools that are expensive to replace. Carpenters also have a higher frequency of claims for tools than other trades, which pushes the average premium to £86.68 a year. If you employ anyone you will need employer's liability insurance. The most common public liability claims for electricians relates to fire, which can be devastating. Liability insurance aims to cover the cost of such claims. The average annual premium for an electrician is £126.32 and prices at Axa start at around £87. Axa's average tool and personal accident insurance premiums for carpenters are £69.59 and £61.92 respectively. As with all other trades, it's worth reading the rest of this article to check whether any other forms of cover are appropriate for your work or business. Unsurprisingly, the most common claim for painters relates to paint spills. Carpets and wood flooring can be expensive to replace so one of the best ways to avoid claims is making sure the floor is well protected. Public liability insurance may be able to cover claims if anything does go wrong. Axa says its average premium is £125.35 a year and prices start from £92. Its average tool insurance premium costs £63.90 and painters and decorators pay less than other trades for personal accident cover - the average premium is £42.56 a year. Plumbers face higher public liability costs than other trades because the damage caused by a burst pipe can be extensive and it takes time to investigate. So higher premiums reflect the potential cost of a claim rather than a higher frequency of claims. Axa's plumber public liability cover starts at around £233 and the average premium is £344.07. Personal accident insurance can be more expensive than other trades because claims for 'plumbers' knee' are so common. The official name for this injury is prepatellar bursitis, which refers to swelling at the front of the knee. Axa says plumbers pay £117.33 a year on average. The average price of cover for tools is around £65 a year. Check the rest of this article to see if any other insurance is relevant to your work. What types of builders' insurance are there? While public liability insurance isn't compulsory by law, it can protect you against any damage you might do to third party property, or any injuries against a third party, as a result of your business or work. It can also meet any legal costs that arise from a claim against you. This can be useful for all tradesman, including builders, plumbers, carpenters, electricians and painters. Mistakes do happen in jobs such as building and plumbing. If you accidentally hurt a client or damage their property through your work, public liability insurance can help to pay for any compensation you owe. For example, a client may slip over a wet floor that isn't marked by a sign. In this case, they may be able to claim compensation. Take a look at our article on the cost of public liability insurance for more information. Employer's liability insurance is compulsory if you are an employer, for a minimum of £5m of cover. If any of your staff becomes ill or injured and blames you, it can protect you if they make a claim against you. For instance, if an employee in your warehouse is hurt by a forklift, or one of your employees trips over a loose cable, there is a chance you could be liable for a compensation claim. Employer's liability insurance can help you cover the costs of any claim made against you. Remember that you are still expected to protect the health and safety of your employees even though you need to have insurance. You may not be able to claim if your insurer believes you have not met your responsibilities. Professional indemnity insurance can protect you if a client thinks you've made a mistake, or if you give a client what they think is bad advice, and they make a claim against you. This can include professional negligence, losing documents or data, breaching copyright or confidentiality, defamation and libel or loss of goods or money. For example, if you are handling a client's data and you accidentally send it to the wrong person, a client could sue you for breach of confidentiality. In this case, professional indemnity could cover the cost of any claim made against you, as well as the legal fees resulting from it. There are some exclusions to professional indemnity insurance. Usually, it won't cover costs related to reputational damage that may be caused by your mistakes. Business interruption insurance can cover you for loss of your income during a period when you cannot work. This could be because of damage to your equipment or premises because of a fire or flood. It can cover your pre-tax profits and may be able to cover increased costs of your business (such as extra accountant's fees). Business interruption insurance is often included as an extra in business insurance policies. Sometimes, for example, it is included under buildings cover. Personal accident insurance is designed to protect you and your business in case you suffer an injury while working. If you injure yourself falling off a ladder while painting a house and are unable to work, personal accident cover can pay out a lump sum or weekly instalments. Personal accident insurance is different to business interruption insurance as the latter usually only pays out due to some form of disaster. Some personal accident insurance policies can cover other members of staff as well - a key member of staff, like a director, for example. Business equipment insurance can cover any equipment you need for your business from damage, loss and theft. This can include any specialist equipment you need in your trade; for instance, if you're a plumber, any tools you need to fix someone's piping. You can usually cover your equipment either within your business premises or worldwide. There may be some exclusions for things like laptops. Also, if you need cover for your equipment while you travel to your job - cover for it being in your van, for example - you may have to pay an additional premium on your van insurance. Find out more about business equipment cover in your van. Stock insurance is often an optional extra on top of your business equipment or contents insurance. This can cover your stock, materials and customer goods from damage, loss and theft - for instance, if there is a fire or flood that causes damage to your stock, meaning you can't sell or use it, it may be able to provide you with the money to replace it. Stock insurance usually will provide the money to replace your stock at its wholesale price, rather than its retail price. For this reason, it's important not to undervalue your stock. Equally important is to make sure you don't overvalue your stock, as it could mean your claim is unsuccessful. Bear in mind there will be some terms to this policy. For instance, some insurers may require you to let them know if your stock increases or decreases. You may also have to stipulate the conditions in which your stock is kept. Cover for your business premises is usually bought separately from business insurance. Much the same as home insurance, insurers usually ask for the rebuild value of your premises, and the value of the contents within. This insurance can cover your property against perils such as weather damage, flooding and fire. And it can protect your equipment from theft and even accidental damage. Most insurers will require some minimum safety standards in order to insure your property. This usually includes 5 lever mortice deadlocks on all doors. Insurers will generally look favourably on additional security measures, such as security alarms. Check out our article on the best home insurance for more information on buildings insurance. Contract works insurance is designed to protect tradesmen from loss when they are working on a building site. The idea is that the insurance can pay to get the work back to where it was before an incident happened. It is usually quite comprehensive and can cover you for a range of losses, including fire, flood, storm, malicious damage and theft. If, for instance, you were building a conservatory, contract works cover could insure the conservatory while it is being built, as well as any labour or tools. Sometimes, contract work cover can be extended to include things like your plant (or factory) or any temporary buildings you might erect while carrying out a job. However, it won't cover any existing constructions. For instance, in the conservatory example, if there were a fire at the house, your contract works insurance could pay for the cost of repairing or rebuilding the conservatory but not the rest of the house. Plant insurance can cover any costs that occur at either your own plant or a hired plant. This can include both temporary buildings and machinery - so if you own or hire concrete mixers, forklifts or cranes, you can probably cover it under plant and equipment insurance. This insurance can cover you for plant equipment damaged by fire, transit, or stolen. Policies may cover hire charges as a result of loss or damage to a hired plant. Some will even offer cover for loss of keys. Bear in mind that plant insurance often won't cover stock - you'll have to purchase this separately. If you do have a plant you need to insure, it might be worth considering business interruption insurance as well to cover your income if there is a problem with your plant and you are unable to work. If you have a van or truck, you will need commercial vehicle cover. Axa offers three types of van cover: personal, sole trader, and limited company/partnership, depending on whether you own your van or it is company owned, and what you use it for. If you need to insure more than three vehicles, some insurers offer fleet insurance. This insurance covers several vehicles under a single policy. This can help to simplify your insurance and may save you some money. Remember that if you need insurance for your equipment, you may have to pay an additional premium. Some insurers might not even cover your tools and equipment while it is in your van, so read the policy documents carefully. Read more about the best van insurance companies here. If you conduct any of your business online, it's worth thinking about cyber risk insurance cover. Cyber risk insurance can protect your business from any potential data breaches, as well as the legal costs of any claims resulting in a breach of data. This can be useful if your business holds sensitive information on clients. On top of this, it can pay for the costs of repairing your website and replacing any data that is lost as a result of cyber attack. Some insurers, such as Hiscox, focus their product on getting smaller business back up and running after a cyber attack. This can save you time and potentially be cheaper than getting external help. Some insurers offer cyber risk insurance with their general business cover, but it might be worth looking at dedicated cover if you heavily rely on your website for business. Read our article on cyber risk insurance cover for more information about this. If you supervise self-employed tradesman as a contractor, they should be covered under your public liability insurance. They should still be covered if they use your materials and equipment. However, if you subcontract tradesman without supervising them and they use their own materials, they will likely need their own cover. Remember that employer's liability insurance is mandatory if you contract tradesman to work for you. This is the same for you: if you are subcontracted and work under supervision, their insurance should cover you, but if you are unsupervised, you will need your own cover. Make sure you confirm whether or not you are covered if you are contracted by asking your contractor, especially if you're working under supervision. Direct Line offers £1m and £5m public liability cover, and up to £10m employer's liability cover. It also offers the optional extras of stock and site cover, cover for tools up to £100,000 per employee, cover for your own or a hired plant, contract works cover and personal accident cover. It does have some exclusions. If your business undertakes work involving mining, underpinning or ground stabilisation, the company cannot offer you a quote online. However, it says it may be able to offer you a quote if you call them. Get a quote from Direct Line for public liability insurance. Axa offers business insurance suited to builders, with up to £5m public liability insurance and £10m in employer's liability cover. The company offers tools and equipment cover, as well as plant equipment and contract works cover. For tradesmen the company can offer optional van insurance, too. This can include a courtesy van if yours is off the road, new for old cover and up to £250 personal belongings cover (for things like laptops or satnavs). Axa's public liability insurance has some significant exclusions. These include legal liability arising from work on railways, nuclear plants, docks or harbours, quarries, mines and dams. Get a quote from Axa for public liability insurance or check out our in-depth review of Axa business insurance. NatWest's Tradesman Insurance policy offers public liability cover of £1m, £2m, £5m and £10m. It also offers optional cover for tools and business equipment up to £10,000, as well as cover for plants and contract work and personal accident cover of up to £10,000. There are some important exclusions to take into account when purchasing NatWest's tradesman insurance. Some places are designated as 'high risk' environments, including mines, airports, airfields, quarries and docks. NatWest may raise your premium or be unable to insure you if your company works in a high-risk environment. NatWest also offer some information on their website for why builders, carpenters and joiners, electricians, plumbers, gardeners, painter and decorators and cleaners may need the various types of insurance. Get a quote for public liability insurance for Natwest from their website. Hiscox provides public liability insurance of £1m, £2m or £5m and provides other optional extras, such as employer's liability and cover for portable tools, business interruption, and buildings and contents. It also provides office insurance that can cover the cost of replacing repairing any stolen or accidentally damaged office equipment. Hiscox also offers cyber risk insurance. This can protect your business if it suffers a data breach or a malicious attack. There are some exclusions to Hiscox's public liability cover. This includes things like war, terrorism or nuclear risks, as well as risks from asbestos. Its employer's liability insurance also has some exclusions, such as a lack of cover if your employees are offshore. Get a business insurance quote from Hiscox. The backbone of Aon's tradesman insurance is public liability cover. It offers public liability insurance up to £5m. The company also offers a number of additional cover options, including employer's liability insurance, tools cover up to £10,000, plant cover, stock cover, contract works cover and personal accident cover. Aon has a number of exclusions to its policy. This includes work on bulk oil, petrol, gas or chemical storage tanks or chambers, work on railways and motorways, work on quarries, and others. Make sure you check its full list of exclusions before you purchase a policy. What else do I need to know about builders' insurance? Remember to check all the exclusions of your policy by reading your policy documents. Some insurers may define certain environments as high risk (such as airfields, quarries and mines). If you work in these places, your premium may be higher, and some insurers won't be able to insure you at all. Some may require you to call to receive a quote and won't be able to give you a quote online. Remember that if you try to claim and are breaking one of the insurer's rules, your ability to claim may be affected. If you have a website to promote your business, some business insurance policies may be able to offer you cyber risk insurance. However, this is often an optional extra or a separate policy in its own right. Most companies won't insure you if you are subject to bankruptcy within a recent time period - NatWest's is five years, for example - or if you have had insurance refused in the past. Get 20% off your business insurance through our free groups if you are a builder, carpenter, plumber, electrician, or painter and decorator.